Shop for reptile supplies at VetDepot.com. Don't get caught without the supplies you'd need to take care of your reptile or amphibian during a disaster. Visit VetDepot.com and use this suggested shopping list to stock up and create a disaster preparedness kit just for your reptilian pet. Make sure you have a two week supply available at all times. Fresh fruits and vegetables might be hard to obtain during a disaster, so you can keep frozen ones in case of an emergency. An ice chest should also be on your shopping list just in case the power goes out and you need a place to store your reptile's frozen food. For some species, it might be appropriate to keep canned fruits and vegetables stored in their natural juices (and with no salt added). Some baby foods may also work. If your pet eats pellets, store them in airtight, waterproof containers and rotate the supply every three months. Be sure to include a backup feeding bowl (if your reptile eats from one) and a hand-operated can opener. Have at least two weeks' worth of water on hand. Keep water in plastic containers in a cool, dark place. Rotate your supply every two months. You may need dechlorinating drops as tap water has chemicals in it that can be toxic to reptiles and amphibians. If your pet needs a spray bottle, make sure you have an extra one of those. If you have an aquatic pet, then you'll want to include an air pump or bubbler in your kit. Many species of reptiles and amphibians require dietary supplements. If your pet needs those, be sure to include them in your disaster preparedness kit. Talk to your veterinarian about what items to include in a first aid kit suitable for amphibians and reptiles. Some of the products they recommend may include an antibiotic ointment (like Zylafen), disinfectants, gauze, tweezers, styptic powder to stop minor bleeding, and cotton swabs. The type you use varies from species to species, and some may not need it. If your pet does require substrate, include their regular brand as part of your emergency kit. Because reptiles and amphibians are ectotherms, they don't produce internal body heat and instead require an external heat source. VetDepot carries a number of heaters and light and heat combo fixtures for terrariums and other reptile habitations. Whatever type of heat source your pet needs—a heat lamp, an under tank heater, heat rock—make sure you have a functional one on hand as part of your disaster supplies. 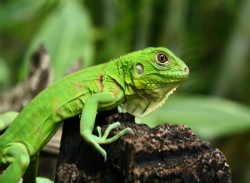 Most reptiles and amphibians require full-spectrum UVB light to help them synthesize vitamin D and utilize calcium. If your pet needs one, be sure to include the appropriate lighting fixture in your kit. 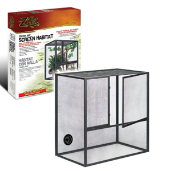 If your regular cage or terrarium is too large to take with you during a disaster, you should obtain an evacuation cage. Get one that has a secure lid and has no gaps that your pet can escape through. If your pet requires temperature regulation, a solid-walled cage is probably the best option. While terrarium accessories aren't essential during an evacuation, they can reduce your pet's stress. Rocks for basking, hide boxes, plants, and other decorative items are things to consider including in your reptile disaster preparedness kit. If your pet requires long-term medications, make sure to have a two week supply as part of your disaster kit. During an evacuation or emergency, your vet may be affected and may not be able to fill prescriptions. Dish soap and paper towels are also helpful for cleaning food and water dishes and other messes. When you clean your pet's enclosure and dishes, be sure to rinse them well because reptiles are sensitive to chemicals absorbed through the skin. Extension cords and possibly even a generator in case the power goes out are great items to have as part of your reptile disaster preparedness kit. They will make sure you can use the light and heat sources your pet needs to survive.